There are few bonds as strong as those between siblings. The friendship that flourishes over the years creates a lifetime of cherished memories that hang in the hallways of our hearts. But, for Avery Paladino and her older brother Ethan, one word changed the course of their lives forever – cancer. Diagnosed with terminal brain cancer at age 11, Ethan needed his little sister, then 8, like never before and she didn’t let him down. Now three years after Ethan’s death, Avery is honoring the memory of her brother by inspiring crayon collection drives in her hometown, many of which benefit Child Life Services at the University of Virginia Children’s Hospital in Charlottesville, VA.
Ethan was a patient at UVA where he and Avery would spend hours coloring to pass the time and forget the pain. After his death, Avery learned about The Crayon Initiative from her school and organized several crayon collection drives with area schools to collect and donate crayons to The Crayon Initiative. But it wasn’t until UVA community volunteers Mike and Alice McCorry introduced The Crayon Initiative to UVA Child Life did all the pieces fall into place. “UVA wants to be good stewards in the community. We contacted them about receiving the crayons and they said it was a no-brainer and it made a lot of sense. They’re all on tight budgets,” remembers the McCorrys of the conversation with the hospital. 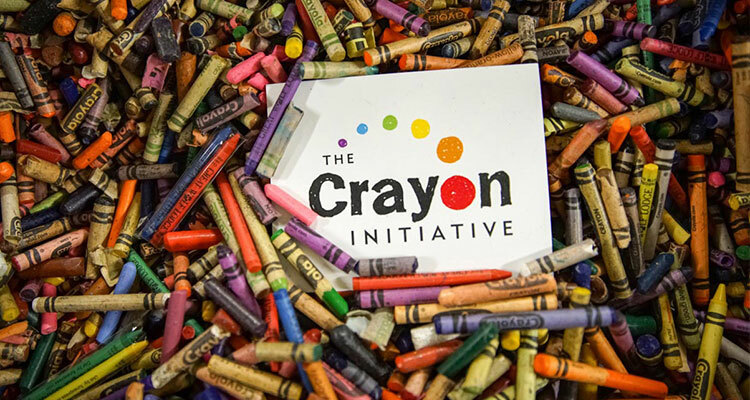 Together, UVA and the McCorrys have recruited 38 area schools to participate in crayon collection drives inspired by Avery Paladino’s efforts and are planning a year-end celebration in April. UVA looks forward to continuing to raise awareness about The Crayon Initiative and the importance of the organization to pediatric patients and their families. “I recently participated in a hospital tour with Child Life Specialists and they shared that The Crayon Initiative helps us so much and having that resource to provide crayons – the most asked item by children – is so helpful,” says Lightner. Lightner explains The Crayon Initiative is an easy way to become involved in philanthropy with kids helping kids. It’s easy for them to do and give back. Plus, it’s powerful and fun.